We're new to UpBoards so are looking for some guidance on what touchscreen displays are available for the UpCore. The size of the touchscreen is important to us and we are looking at models around 5 inches. We'd probably be looking at running Ubilinux, but we could look at other OSs if that were to give us touch screen options. The OS should not be a critical issue for the selection of display. You only need to check the driver of touch controller if it support Ubuntu. For project base users ( few hundred piece) above, we do have one eDP board available. 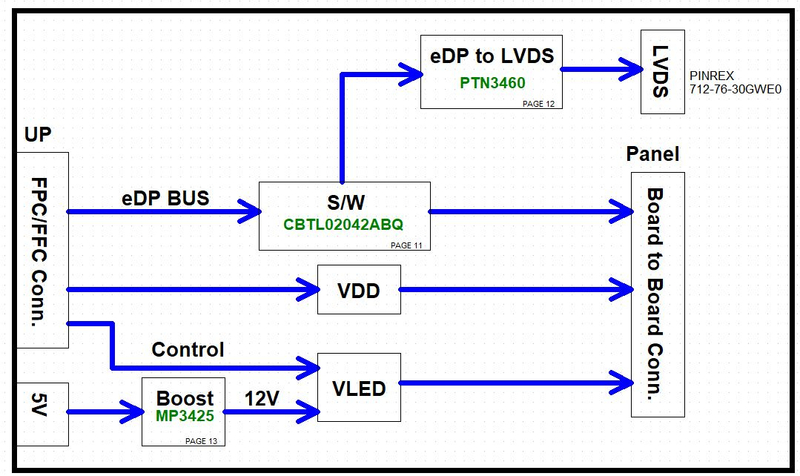 It supports convert LVDS signal of your LVDS panele to DP signal of UP Core/UP board . However, there will be video BIOS customization required to fit to your LVDS display frequency. The eDP board looks to be a potential solution. Could you post the details of the eDP board so we can look into this further? Regarding the modification of the BIOS, would the Up BIOS Pre Settings service be able to help with this given details of the LVDS display? Here is block diagram of eDP board. This could give you some idea in specification. For the modified BIOS, BIOS pre-setting service could not do. Because we need to get the LCD from you to adjust VBIOS frequency. Sometimes it works straight forward without modification, most of times, VBIOS modification is required. 2. UP team will provide a link for you to buy 1pcs of eDP board. If it works straight forward without BIOS modification, then you can skip the step 3-5. Since VBIOS requires a lot of engineering resources, we would like to offer it only for projects more than a few hundred pieces. Is that discussion closed? Could we mark it as RESOLVED? Yes, thanks for the information. All very helpful. We'll be in touch when this issues needs addressing. Thanks.